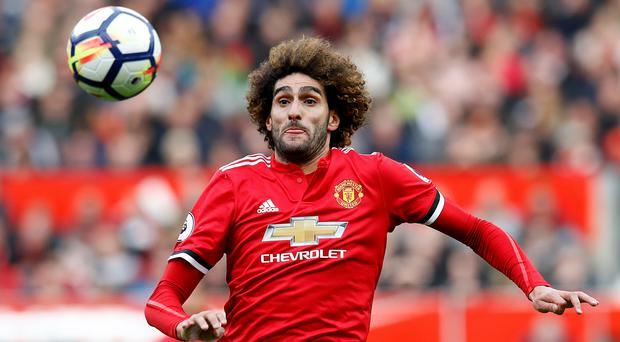 Marouane Fellaini is close to agreeing a lucrative new contract that will keep him at Manchester United for another two years, according to reports emerging from his native Belgium. Fellaini's future appeared to lie away from United after he confirmed he would be making announcement over his next move on July 1st, with Italian and Turkish clubs believed to be in talks over a move for the 30-year-old. Speaking to the media on Tuesday, Fellaini gave a strong hint that he had made a decision over his future, in comments that led many to believe he had decided to leave United. When asked whether speculation over his future was affecting his work with Belgium at the World Cup he stated: "No, since a few months, I am used to it. I am strong mentally to deal with it and soon I will say where I will be playing next season." Yet Belgian publication HLN Sport are now reporting that Fellaini is on the brink of agreeing a deal to remain at United, after manager Jose Mourinho made a final push to keep hold of a player he has repeatedly supported during his time at Old Trafford. Many United fans have alternative view of Fellaini and view his presence in the United squad as evidence of the club's decline in recent years, with the news that he may be staying at the club after all greeted with predictable pessimism on social media channels. As Fellaini is out-of-contract this summer, United will need to hand the player and his agent a hefty signing on fee as well as an inflated wages package to remain at the club and yet those stipulations appear to have been met according to the HLN Sport. If Fellaini stays at United, it may suggest the financial offers made to him elsewhere were limited, as he has persistently stated a desire to play more regular first team football and he seems unlikely to get that wish if he remains at Old Trafford.